It’s been awhile with all of the Blackrock Mountain coverage coming up, but it’s finally time for another Hearthstone guide to help you build up your collection of cards. This time around, we’ll be looking at the best neutral rare cards that can benefit almost any deck. Good rares aren’t that hard to come by, but it may be worth crafting some of these if you just can’t find them through packs. These cards are featured based on being good in general and working well in most decks rather than filling specific deck types. 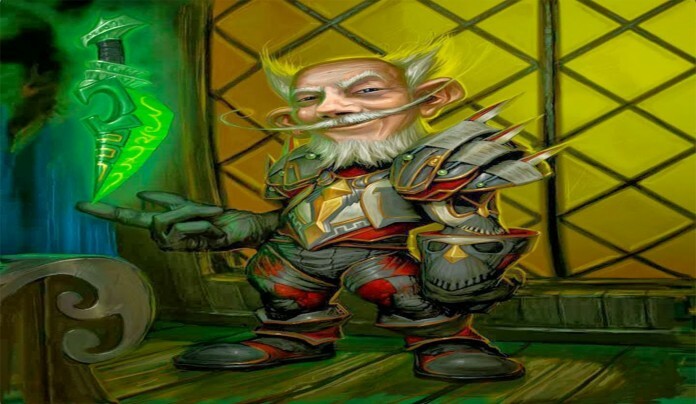 Unfortunately, the Classic and Goblins vs. Gnomes sets won’t be split up like in the commons guide as GvG didn’t introduce many good neutral rares into the game. In fact, there’s only one GvG card on this list. It may seem unfair to the expansion, but I’m more interested in pointing out good cards to my readers rather than represent underwhelming cards just for the sake of it. This is definitely the most situational card on this list, hence why it’s only at #10, but it’s still a valuable card. Minions with 2 attack power aren’t especially common in the meta and even those you will see generally aren’t big threats. 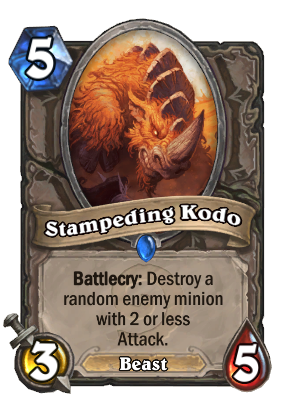 Kodo is most useful in Paladin and Priest decks as they have ways of reducing an enemy’s attack value and opening up more targets for the Kodo. Still, removing an enemy minion with just a battlecry is pretty strong. It’s not good enough to run in just any deck, but it is versatile enough to be worth hanging onto. Not much to complain about with the Sunfury Protector. She can be decent as just a turn 2 play if you have no better options in your hand and need a body on the board. 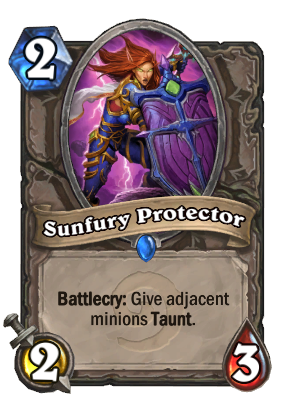 She can also be a lifesaver in the late game with the ability to give any friendly minion taunt. In fact, she can affect two of your minions at once, but you may be more interested in keeping that second minion alive. Protector is worth playing around with just for the lessons she’ll teach you in the importance of placement on the board. Throwing your minions anywhere can leave them vulnerable to certain spells and effects and strategic placement can save them from destruction. Likewise, you want to consider how to set the board to get the most out of your own effects. Nothing will make you feel worse than having to play Protector in-between one minion you wanted to taunt up and one you’ve been trying to keep alive just because you didn’t place something in-between them when you had the chance. At the cost of 1 attack point that you would have had with a Chillwind Yeti, Violet Teacher allows you to fill the board with expendable token minions and overwhelm your opponent. The only thing to keep in mind with Teacher is that you have to spend a spell to trigger her ability and this can potentially lead you into a value trap. You want to think of the Violet Apprentices as a bonus to casting spells that you already plan on using rather than using your spells as a means to flood the board. If you toss out your spells recklessly, your opponent can take advantage of that and leave you desperately behind on resources. Played wisely, Teacher can be fearsome minion that decimates the field. Here’s our only entry from the Goblins vs Gnomes expansion and it’s a good one. He might appear questionable at first glance given his poor stat line and the randomness of where he aims his 4 damage battlecry. However, he proves far more reliable in practice as getting him to hit the best target is simply a matter of maintaining control of the board and clearing the weaker minions as best as you can first. His ability to trade well with such ease makes him a valuable asset and simple needs some clever set-ups to crush the opposition. Charge and divine shield make for a fairly potent combination. 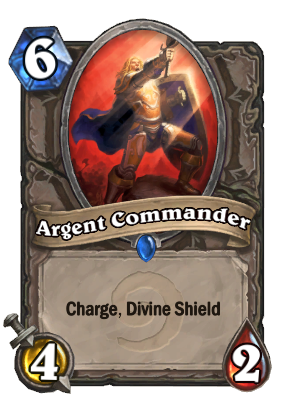 Argent Commander can strike as soon as he steps on the board and his divine shield means that he won’t have to sacrifice himself in order to take down an imposing target as divine shield completely absorbs damage for a single attack. Not only is he great at controlling the board, he’s also a good late-game play in aggressive decks. He’s not likely to live long with only 2 health, but the fact that your opponent still needs to content with him at all after he’s already dealt a major blow makes him extremely valuable. 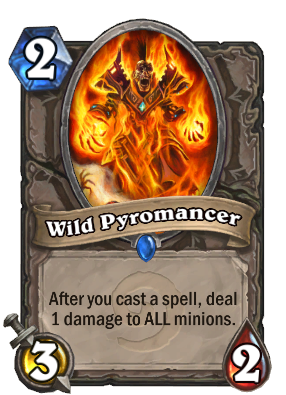 There can be times where a Wild Pyromancer is the last thing you want to play as he can tear up your own minions just as quickly as he can tear up your opponent’s. Still, the number of combos and board-clears that he can carry out in various decks make him a must-have. 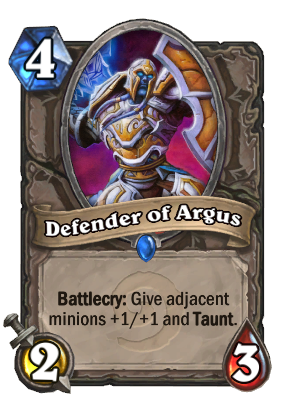 He’s deadliest in Paladin where the Equality spell allows him to instantly wipe the entire board, but any class can find a great use for him. His stat line is also excellent, meaning the only decks that he is horrible in are the ones built around flooding the board with small bodies. Otherwise, he’s a strong contender. Just keep in mind that his effect goes off every time you play a spell and it’s easy to make critical mistakes while you have him on the board. Take everything I said about the Sunfury Protector earlier and double it for the Defender of Argus. While his stat line is weak, Defender’s incredible battlecry easily makes up for it. Whether you’re trying to regain control of a game or pushing for a win, he can quickly turn a fairly weak board into a force to be reckoned with. The only caveat is that you need to already have minions on the board to buff, so he is somewhat weak in slower decks dedicated to playing large bodies in the late game. If you have a fair share of smaller minions that can swarm early on, on the other hand, he will make juggernauts. While Protector can be played on an empty board with few regrets, Defender’s value lies entirely on his battlecry and needs to be saved for just the right moment. This card does so much that it’s pretty hard to resist. Minions with draw effects tend to have terrible stat lines and, while a 4/4 for 5 mana isn’t phenomenal, it’s still a tough enough body to put up a fight. 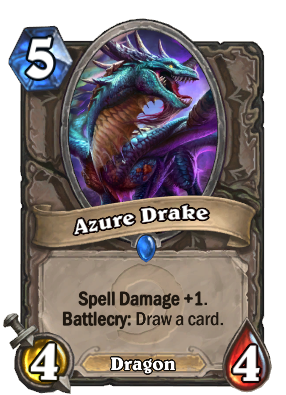 Add bonus spell damage and the soon-to-be relevant dragon synergy onto that and this is a difficult card to resist. This is already a fairly popular card and it’s only going to see more use once Blackrock Mountain releases. If you’re looking for some late-game protection, nobody is going to keep you secure like a Sunwalker. For as good as charge and divine shield go together, taunt and divine shield are even better and allow you to wrestle back control in almost any game. 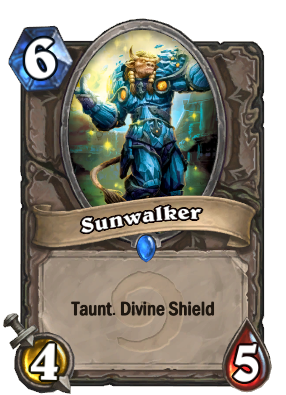 Sunwalker is an incredible durable minion that your opponent will have little choice but to force their way through and take heavy damage as a result. Even in the unfortunate event that she gets silenced, her 4/5 stat line alone will be enough to stay in the fight. Definitely put her in your collection. 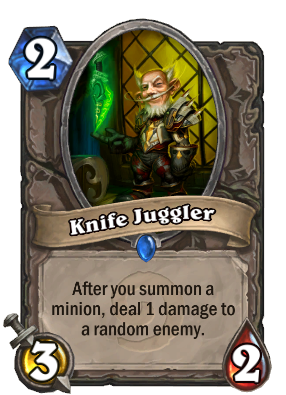 Honestly, it’s debatable as to whether or not the Knife Juggler needs to be nerfed. 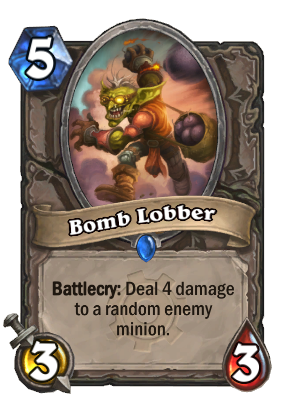 He already has an excellent stat line as a 3/2 for 2 mana, but his special ability to deal 1 damage to a random enemy whenever you summon a minion makes him one of the most useful cards in the entire game. In token-heavy decks like Zoolock, Juggler can be devastating if played at the right time. However, there isn’t exactly a bad deck to include a Juggler or two in. Even if his knifes only hit the opponents face, he’s still doing more work than most other 2-drops out there. 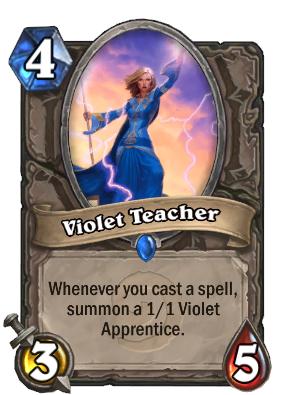 Like with the Violet Teacher and spells, you will want to be careful about playing too many minions at once and making yourself vulnerable board-clearing spells. If you start crafting rares, make sure you start with the Juggler. That’s it for this Hearthstone guide. Be sure to keep an eye out for these handy cards and start improving your deck builds. Next time, I’ll visit the Mage class to catch up with how much it’s improved with GvG. Until then, you’ll be happy to know that I’ve retired the cheesy line that I used to throw in at the end of these guides.